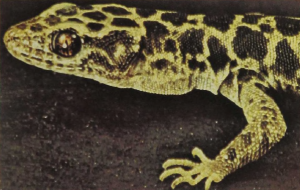 The night lizards are a small group resembling geckos in having fused eyelids and a vertical pupil that opens wide so they can see by starlight, but which closes to a slit during the day. These small lizards, which are less than 3 inches long, occupy a restricted area of Central America, the southwestern United States, and Cuba. 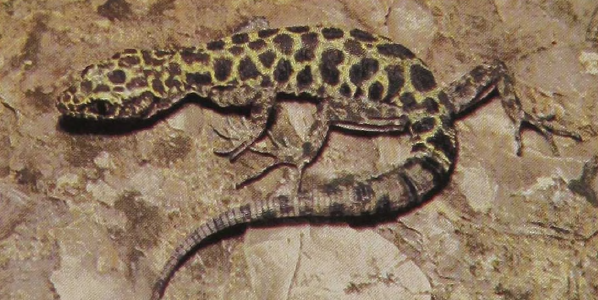 Granite Night Lizards are one of four North American species restricted to southern California and Baja California. They live on rocky outcrops and their blotched color pattern camouflages them well in their habitat. The Granite Night Lizard feeds on insects and gives birth to from one to three living young.